Wastewater disposal systems, also known as a septic system, take the sewage from your home or business, treats it, and then releases it into the ground. This can be an environmentally friendly way to get rid of wastewater if the septic system was designed properly, and if maintained properly. 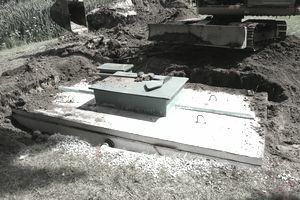 The process of selecting the wastewater disposal systems starts once the soil has been altered on a piece of property. Many options of wastewater disposal systems may no longer be suitable due to differences in height and several other conditions affecting the location of the wastewater system. Permeability is defined as the rate at which water will move in soil. Most wastewater systems utilize the soil to dispose of the treated effluent, so its basic information to know the properties and permeability of a site. Identifying this information, you can determine the area needed to dispose of the effluent generated by the building. Soils that have low clay contents usually will have high permeability rates, requiring less absorption area, and occupying less space to work and collect effluents. Soils with high clay content, reddish-color soils, are not the best type of soils for individual wastewater collection systems. Seasonal water tables are caused by a restrictive layer, like clayey soils, that restrict the movement of runoff water deeper into the soil. As rainfall increases, the soil material above these layers becomes saturated, reducing the capacity to absorb water. These water tables may surface in ditches or along the lower parts of hillsides. Sometimes they may even flow laterally in the soil to an area that allows movement into drinking water aquifers. Once wastewater enters a saturated soil, it moves rapidly and prevents the soil from effectively filtering the pathogens, bacteria, and viruses, present in the wastewater. For these reasons, it's essential that any underground wastewater system be placed at least 12 inches above seasonal water tables. Often these water tables are so close to the soil surface that a 12-inch separation would put a wastewater system above the soil surface, preventing the use of several types of wastewater systems. Some parcels of property are so small or narrow that certain types of wastewater systems cannot be physically installed. This also occurs as there are specific code regulations regarding the minimum installation distance from property lines, buildings, water wells, and other building components. Sometime the combination of parcel layout with low permeability soils will reduce the individual wastewater system options available. Size is the factor that most often renders property unsuitable for an individual wastewater system. With enough property to work with, a wastewater system can be designed at almost every site. Sometimes the area selected for the house site is also the best site for a wastewater system. This often will require the installation of a more expensive system and sometimes off-site systems for wastewater treatment. Eventually, small pump stations and other mechanical pieces of equipment are required to transport wastewater to the corresponding system, increasing construction costs and introducing other maintenance problems to the owner. A few types of wastewater systems, aerobic treatment plants, for example, need to be used daily to function properly. The use of these systems is not recommended on structures used occasionally such as weekend, condos or vacation homes. Septic Tank and Mound Wastewater System: Effluent is pumped into a gravel bed or trenches on top of a bed of sand. Sandy soil carefully placed above the plowed ground surface treats the effluent before it moves into the natural soil. The system extends on-site system use in areas with high groundwater, high bedrock, or tighter clay soils. Evaporation and Absorption Bed: Effluent from a septic tank or aerobic tank flows into gravel trenches or chambers in a mound of sandy soil. Less permeable soil placed at the surface of the mound helps shed rain from the system. Trees that grow around the system and plants on top of the system pull liquid from the sand and transpire the water into the air. Some effluent may seep into the soil. This system can only be considered in a climate where evaporation consistently exceeds rainfall. Sand Filters: Open or buried beds of sand may receive single or repeated applications of effluent, which passes through the media and drains from the gravel and pipe network below the filter. Effluent may be discharged to the environment directly or into a soil absorption or land treatment system. Disinfection often precedes discharge into a stream or land irrigation. Certain types of filters can significantly reduce nitrogen and may be used in areas where soil absorption is impossible.